Which two numbers should replace the question marks? One word has been removed from the passage above. Select that word from the choice below and reinstate it into its correct place in the passage. If 4 apples and 6 bananas cost $1.56 and 9 apples and 7 bananas cost $2.60, what is the cost of one apple and one banana? 1 apple costs $0.20 and 1 banana costs $0.16. Which word below is out of sequence? What number is, logically, missing from the sequence below? "It is a largely agricultural country of varied scenery from moorland, loughs and islands to the beautiful coastline around West Bay." What day comes three days after the day which comes two days after the day which comes immediately after the day which comes two days after Monday? What is the value of –26 – –37? If Milly gives Tilly $60 the money they have is in the ratio 2:1; however, if Tilly gives Milly $10 the ratio is 1:3. How much money have Milly and Tilly before they exchange any money? Which logically is the odd one out? Using every letter of the phrase GIBBON CABLES ACE COBRA once each only spell out the names of three vegetables. You've got a giant genius brain! How is your head big enough for your brain, you ol' smartypants!?! Doesn't matter. What DOES matter is that you're REALLY FREAKIN' SMART!!! Seriously, tell us all of your secrets. We want to gain your knowledge and be exactly like you! Get out of here and go save the world or something, 'kay? You've got... *a* brain. Jury's out on the rest. Hey you. You might not be the butteriest biscuit in the box, or the brightest crayon in the pack. But that's totally okay! 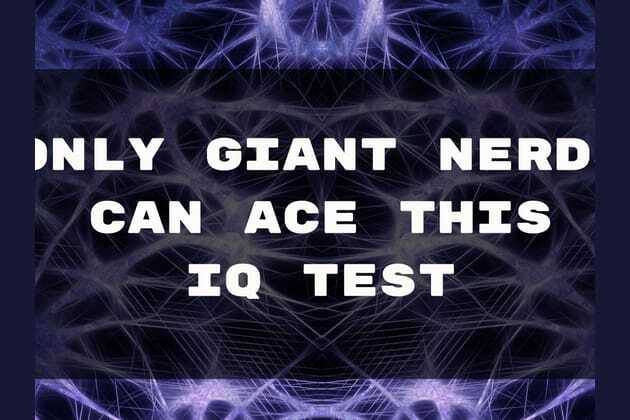 The cool thing about IQ tests is that you can practice them, take them again, and really master the skills within! Go get 'em, grasshopper. We believe in you!